Estación Marítima (Estació Marítima): The majority of cruise ships dock at the modern cruise terminal which lies 5km south-west of the city’s cathedral. There are two main quays: Muelle Paraires which also serves a high volume of ferry passengers; and Muelle Poniente which can cater for the largest of cruise ships. Porto Pi: At times when the Paraires and Poniente docks are already occupied some cruise ships may arrive a little further west at the cargo pier at Porto Pi. Very close to your point of disembarkation is the Porto Pi shopping centre which is the city’s most prestigious retail complex. Dique Del Oeste (Dic de l’Oest): Your least likely point of arrival (and most inconvenient) is on the western sea wall which is further around the bay from Porto Pi. You can check in advance where your ship will be arriving on the Balearic Ports Authority Website. On Foot: Whilst the walk along the waterfront from the Estación Marítima to the Cathedral of La Seu is pleasant enough it takes the best part of an hour (depending on your dock) so won’t be the preferred choice of most passengers. 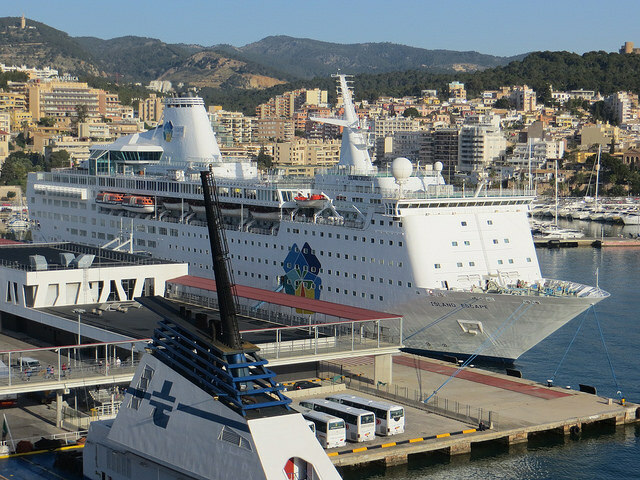 If you are happy to walk just turn right as you leave the cruise terminal and follow Avinguda de Gabriel Roca until you arrive at the city’s main landmark which you’ll see ahead of you throughout the walk. During your walk keep an eye out for the historic windmills up to your left which overlook the bay from the old fishing quarter of Barrio Es Jonquet. Be warned that there’s little shade on this walk which, in spite of its attractions, makes it hard to recommend on a hot summer’s day. Once you’re in the city it’s easy to get around on foot. Shuttle Bus: It is very common for cruise lines to provide shuttle bus services from the cruise terminal to the city centre. They usually drop passengers off close to the cathedral from where you can easily get around on foot. This is a very convenient way to get to the tourist centre. Some passengers prefer to reduce costs by taking the public bus which runs from outside the cruise terminal into the city, the problem is that these buses can’t always cope with the number of people arriving at the port. If you happen to arrive at a similar time to other cruise ships you might find yourself having to wait in long queues for the public bus. Public Bus: The cheapest way into the city centre is on the number 1 bus which operates between the port area and the airport. There are stops opposite both the Estación Marítima and the fort at Porto Pi. If you arrive at the Dique Del Oeste you’ll need to walk a little to get to the bus stop. The service into Palma operates every 15 minutes and takes about 10 minutes to the Plaça d’Espanya. The buses can get very crowded with cruise ship passengers and waits at the bus stop can be lengthy. This public bus service does not go to the cathedral, you can check its route on the EMT public transport website. Tourist Bus: Palma’s hop-on, hop-off bus service is a very popular choice amongst cruise passengers. Its itinerary includes 18 stops with buses running every 20-25 minutes. There’s a bus stop outside the Porto Pi shopping centre (stop 13) and another outside the Estació Maritima cruise terminal (stop 14) right next to the EMT public bus stop. The route includes Castell de Bellver (stop 9) and Moll Comercial (stop 18) near the cathedral but cannot access the small streets of the historic centre to the east of the cathedral. By Taxi: Whilst metered taxis in Palma aren’t particularly cheap, they represent a quick and easy way to get into the historic centre as quickly as possible without having to hang around the port waiting for other means of transport. The journey to the cathedral or the tourist information office (Plaça de la Reina, 2) takes about 10 minutes and shouldn’t cost more than about 15 Euros which is good value when shared with fellow passengers. Palma Cathedral: The official title of Palma de Mallorca’s magnificent Gothic cathedral is La Catedral de Santa María de Palma de Mallorca although it is most frequently referred to as La Seu. Its construction on the site of a former mosque under the rule of James I of Aragon (the Conqueror) began in 1229 but wasn’t completed until 1601. Its central nave is the highest of all Europe’s great Gothic cathedrals. Along with the Royal Palace of La Almudaina it is the city’s most important tourist attraction which can be seen from all around the bay as far away as the cruise port complex. 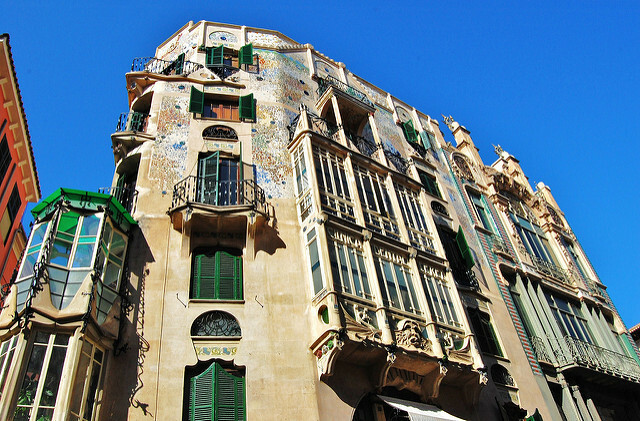 Whilst a number of architectural styles are evident within its interior, it is the relatively minor restoration work carried out by Antoni Gaudí which attracts much attention. You can appreciate its grandeur for free from the outside, otherwise there’s a small entrance fee to go inside. Palacio Real de La Almudaina (Palau de l’Almudaina): Following the Christian Reconquest of the island of Mallorca this former Moorish fortress located right next to the cathedral became a Royal Palace. It still serves as an official residence for the Spanish monarchy although its role is mainly symbolic. 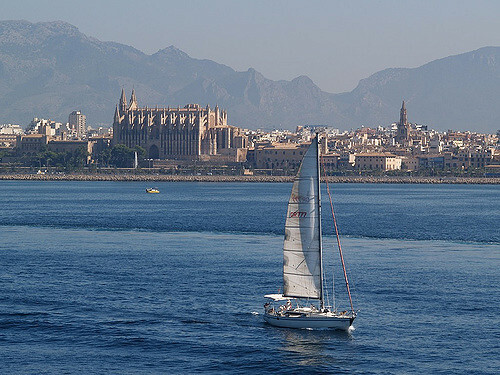 Highlights of a visit include the King’s and Queen’s rooms, the art and tapestry collections and the splendid views from the patio looking over the Bay of Palma. 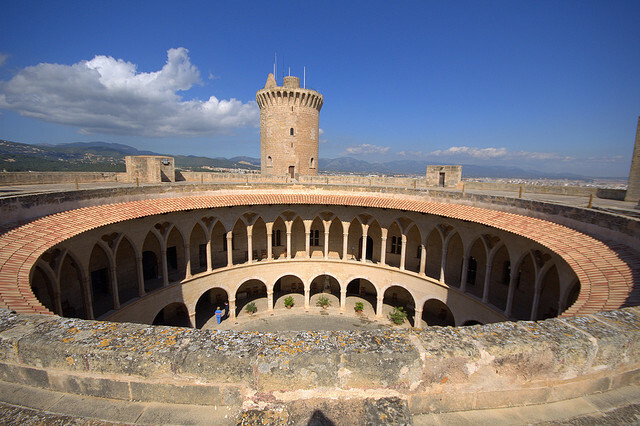 Castillo de Bellver (Castell de Bellver): Standing on a hill overlooking the Bay of Palma, some 2km north of the cruise terminal, Bellver Castle is one of very few circular castles in Europe. Built between 1300 and 1311 under the reign of James II it has served as a defensive structure, as a royal residence and as a military prison over the centuries. Today it is one of the city’s main tourist attractions and is home to a modest History Museum. Baños Árabes (Banys Àrabs): From the year 902 to 1229 the island of Mallorca was occupied by the Moors who made the Madina Mayurqa (modern-day Palma) their capital under the control of the Emirate of Córdoba. Today the small Arab Baths (Calle Can Serra, 7) located just a 5-minute walk east of the cathedral amongst the city’s oldest streets are one of the few reminders of the Moorish era. La Rambla and Beyond: A pleasant option after visiting Palma Cathedral and L’Almudeina is to head for Plaça de la Reina then walk at your leisure along Passeig del Born. At the northern end of this street you can turn left onto Avinguda Jaume III which is one of the city’s most exclusive shopping streets or turn right along Carrer de la Unió which weaves its way around to La Rambla. This is a scaled down version of its namesake in Barcelona which is filled with stalls selling flowers. Other interesting sights in this general area include the city’s main square, Plaça Major, and the fresh food market at Mercat de l’Olivar. Local Beaches: Whilst the island of Mallorca is one of Europe’s most popular holiday destinations, Palma de Mallorca is its capital city with a population of over 400,000. 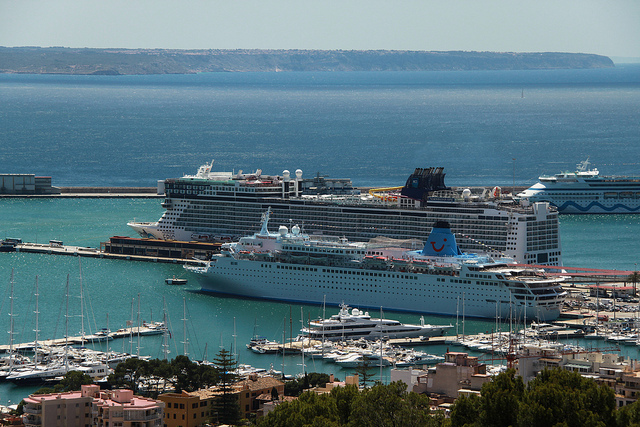 Cruise passengers spending a day in port won’t have time to visit some of the island’s premier beach locations on the north and east coasts but can still get to some nice beaches within the vicinity of Palma. Nearest to the city is the small Playa Ca’n Pere Antoni which is just a short walk east of the cathedral or you can continue to the charming Cala Portixol. For a full scale holiday resort experience you’ll need to take a taxi a little further to Playa de Palma which is a 6km stretch of lovely beach with a promenade full of hotels, bars and restaurants. Another option is to head west from the cruise port and visit the lower key beaches of Cala Mayor or Illetas which are both only a short taxi or bus ride away. If this is your first time visiting Palma de Mallorca there is more than enough to pass your time visiting the city’s attractions. However, if you’re a returning passenger and are keen to discover more of the island then there are various options available to you. 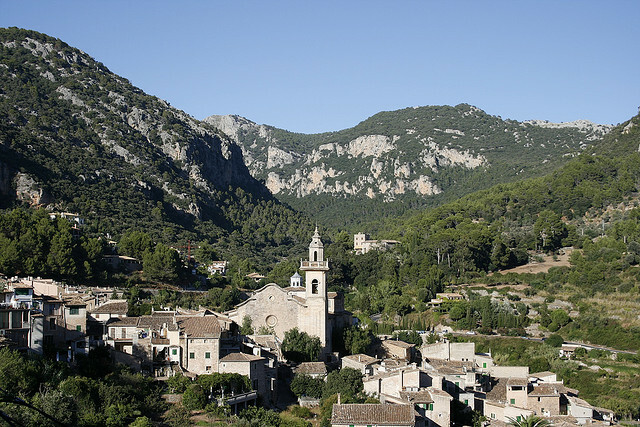 Valldemossa: The most popular shore excursion offered by cruise ships visiting Palma is to the beautiful town of Valldemossa which lies just 23km north of the cruise terminal. Its main attraction is its Royal Carthusian Monastery where Frederic Chopin and George Sand spent the winter of 1838-9 which is documented in her book ‘ ‘A Winter in Majorca’. Aside from the historical interest the town is a lovely place to get a feel for rural Mallorca passing the time in any number of charming cafés. Palma to Soller Train: In the city centre, next to the Plaça de Espanya, is Palma Train Station (Carrer Eusebi Estada, 1) which is the starting point of the Ferrocarril de Sóller railway. 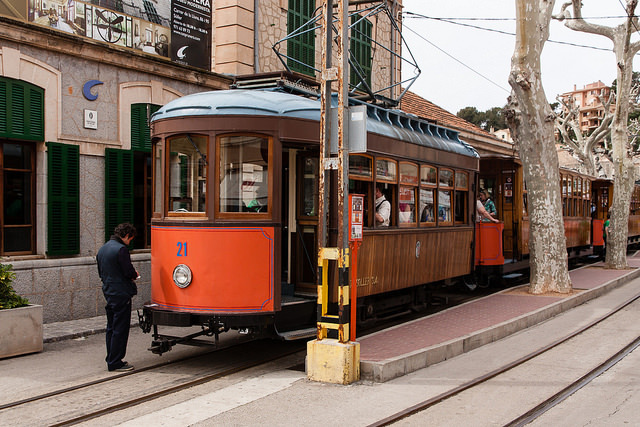 From here passengers can board historic train carriages and take a 27km journey through the beautiful countryside of the Serra de Tramuntana to the town of Sóller from where a tram delivers them to the Port of Sóller. Whilst this excursion is highly recommended you’ll need to check whether you have time to complete it during your time in port. Train timetables are published on the Tren de Sóller website.